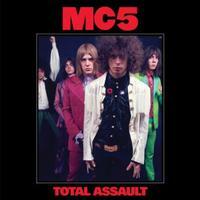 MC5 Total Assault 50th Anniversary Collection is a limited-edition boxed set that features all three of the band's albums pressed on colored vinyl. It includes Kick Out The Jams (red vinyl), Back In The USA (white vinyl) and High Time (blue vinyl). The albums come in sleeves that faithfully re-create the original releases, including gatefolds for Kick Out The Jams and High Times. All three are housed in a hard slipcase with new art and previously unseen photographs by world renowned photographer Raeanne Rubenstein. Singer Rob Tyner, guitarists Wayne Kramer and Fred "Sonic" Smith, bassist Michael Davis, and drummer Dennis Thompson came together as the MC5 in 1965. The band performed for several years before making its first record. The music on Total Assault shows why the MC5 is held is such high regard today with indelible tracks like "Kick Out The Jams," "Human Being Lawnmower" and "Sister Anne."